Abstract artists need to grow beyond previous boundaries to stay relevant. Create a new painting style as part of your New Year’s Resolution. When experimenting with abstract art take note of original painting techniques you create by keeping small samples, or take photos of the abstract techniques to add to a binder for quick reference. 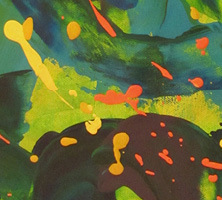 You may not like the results of some of your abstract painting experiments, but these sample abstracts will come in handy later, as you usually find a way to improve upon your initial concept. 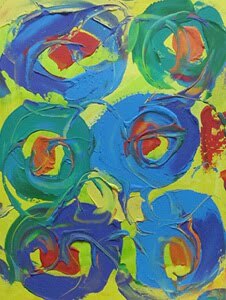 In Abstract art always try new paint colors, color combinations, shapes and movement of brush on the canvas. Use spatulas and other unconventional painting tools to move paint across the stretched canvas to create lines and textures in contemporary abstract paintings. Move up several brush sizes to create a bolder shape, or use several brush sizes in an original modern painting to create contrast and highlight important elements. In my bold abstracts I’ve experimented by adding new elements like buttons and beads directly into the paint of the abstract for a 3D effect. 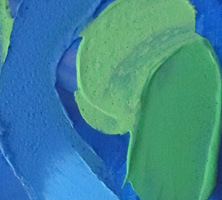 Other things I’ve tried are combing through sections of an original painting to create a wavy ridged effect. 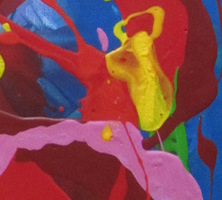 I also pour paint directly on to canvases and blend the colors by tilting the canvas. To thicken paint I’ve added flour to create a ceramic look. Plastic wrap, spray bottles and squeeze bottles are also great. Pushing limits in your art and life is good for everyone. 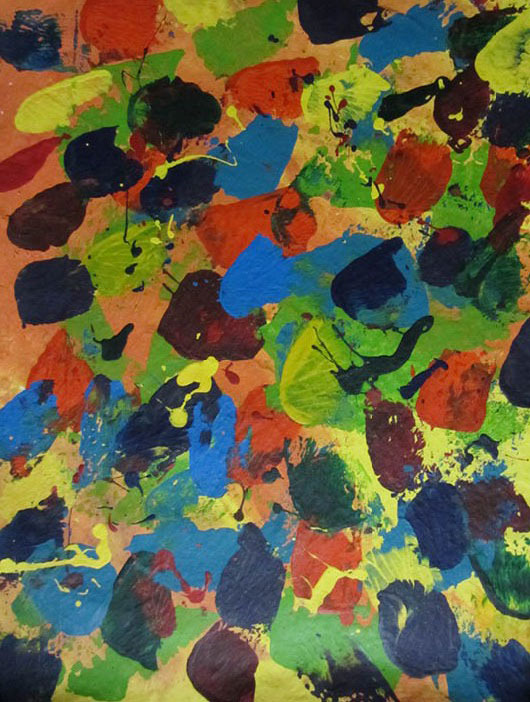 The abstract painting Fairytale Forest shown above is a textured acrylic in yellow, blue and green with specks of orange. 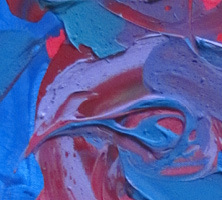 In this modern art piece the paint was poured and blended on the canvas. Walking through a fairytale forest there are scary noises, poisonous apples and a misleading trail that leads to your destiny. It’s the journey that makes the person. This original wall hanging measures 18" x 24". Have a friend who loves abstract art? 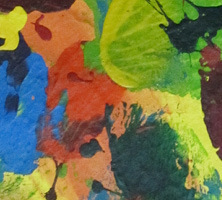 Give them a colorful abstract painting for Christmas. It doesn’t have to be big or expensive. Buy small original modern art instead. There are smaller unique abstract paintings available that are perfect for hallways and little corner nooks. If you are trying to narrow down what abstract painting to buy when shopping for your friend, look at their home and make note of the abstracts they have. Don’t buy more of the same. Select art that’s unique, but will fit in with what they already have. Then look at the colors they use throughout their home decor. Do they like bold colors or soft pastels? Next is there a small area where an abstract would fit? In that case plan ahead and bring a measuring tape to measure that space. You can also go window shopping or browse on the Internet with your friend for contemporary art to seeing what they prefer, but would never buy for themselves. They’ll be truly surprised when they unwrap the abstract art you give them on Christmas day. 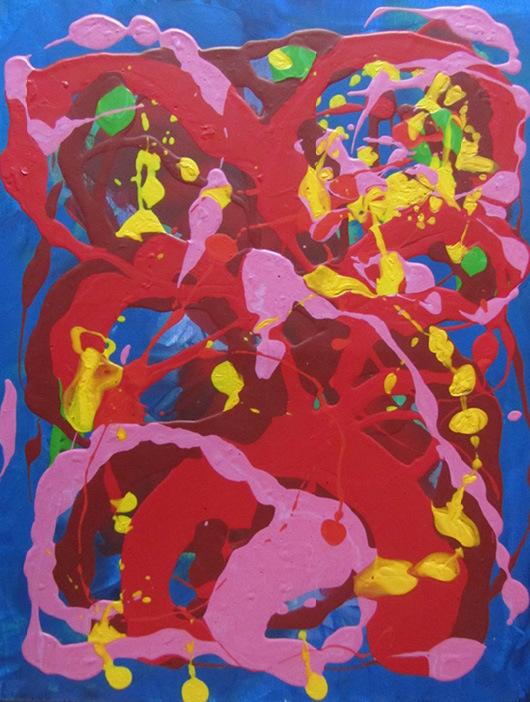 The abstract painting Spirit of Christmas shown above is a textured acrylic in bold red, pink, yellow and green, layered on a blue background. This painting represents the feeling of family celebrating with good food and conversation. Decorations and lights add to the festive spirit of giving and receiving. This original wall hanging measures 18" x 24". Never abandon an abstract painting when it's not developing the way you expect. 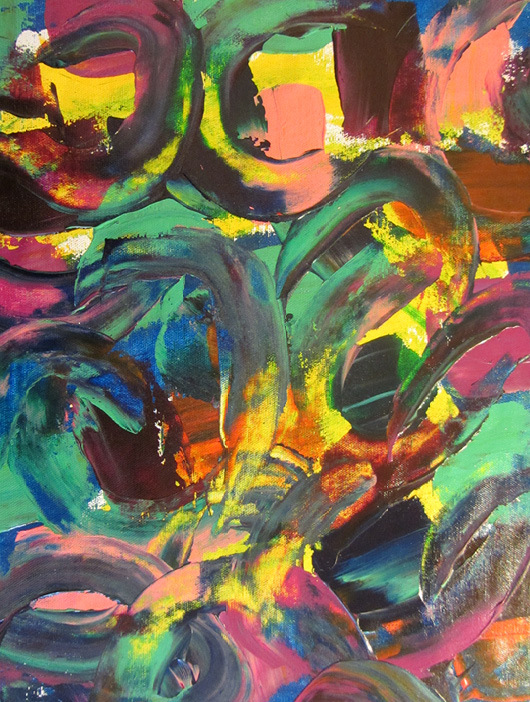 Original abstracts can go through an amazing transformation in later painting sessions. Many times these experimental abstracts are your most memorable and popular finished canvases, because your artistic struggles and moments of discovery are vividly exposed in these modern wall hangings. So take several days to look at your modern paintings and then experiment. Integrate areas in your contemporary paintings that seem disconnected by adding color and texture to pull it all together. When you don’t follow these new developments in your style you can hit an artistic road block, much like writer's block. Also as you develop as an artist, an abstract painting that's not living up to your perceived expectations may actually capture your attention several weeks later. So give yourself the time you need to appreciate your paintings by putting distance between those modern abstracts that seem so different from what you normally paint and your pesky inner critic. You could miss seeing that your painting style has gone through a magical transformation and that you now need to consciously expand it further. 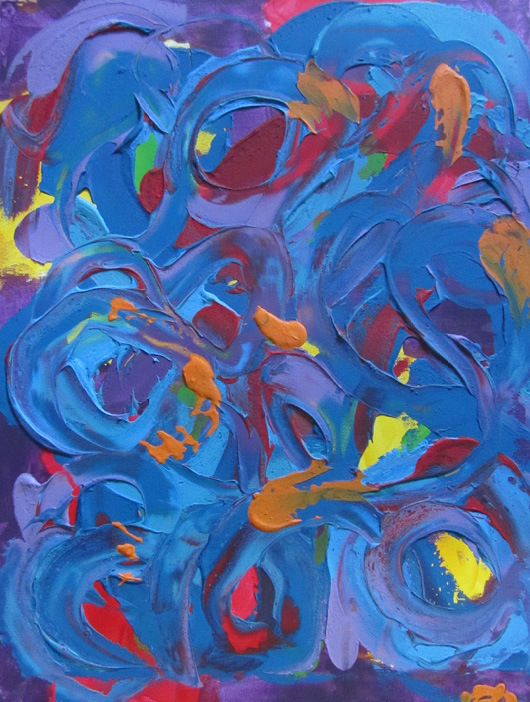 The abstract painting Coming Home shown above is a textured acrylic in blue, yellow, red and pink. Seeing family again for the first time after a long break is magical. You can’t even get through the door, because you are too busy hugging family and as you settle down for dinner you wonder why you ever left. This original wall hanging measures 18" x 24". Create an abstract art studio with an inspiring atmosphere by hanging your own artwork on the walls. Set up your artist easel or painting area so you get the most of the natural light available and add light if needed. I use white light, also called a full spectrum light bulb. For abstract painting you want a calming yet cheery oasis to paint in. It’s your workspace, but you can still add beautiful original abstract paintings and colorful tasteful decor to create the atmosphere you want for inspiration. So choose bold colorful wall hangings and decor, then be organized with your painting supplies. Messy chaos never fosters creativity in me. Keep your abstract art studio clean and organized, so you can start painting at anytime. It’s good to have lots of uncluttered space in your studio, so put blank canvases against the wall and keep paint supplies, mixed paints, brushes and drop clothes in an old dresser or shelving unit until you need them. 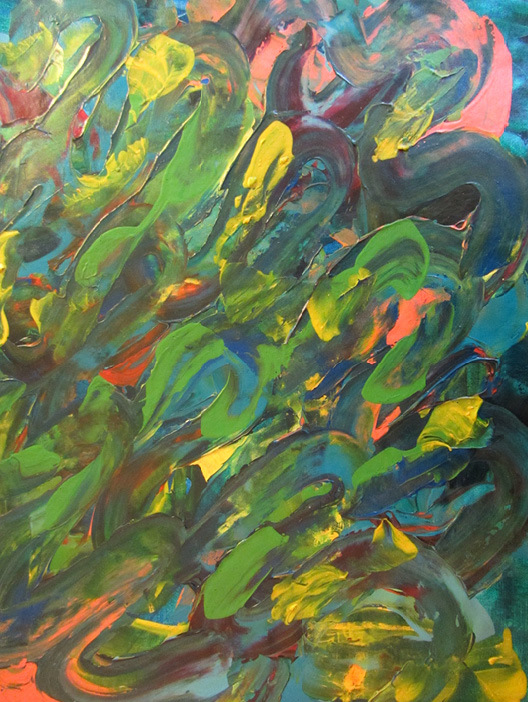 Having space to move around is important, because painting abstract art is about the flow of movement. I put abstracts that I think are finished in another space, because I like to review my contemporary paintings again after not seeing them for a few days. With a fresh perspective I can decide if the paintings are truly finished or need more work. There is nothing worse than overworking an abstract painting that was better left alone. In the meantime I mix more paints and keep going with other abstract paintings. 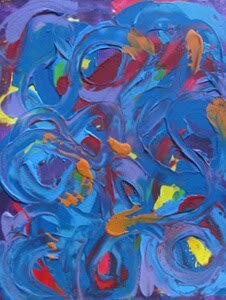 The abstract painting Fire Dragons shown above is a textured acrylic in blue and smoky blue with flashes of orange, yellow and red. Dragons flying in the sky create clouds of smoke, streaks of lightening fire and a frightening noise, but this is just play for them. Playing with fire. This original wall hanging measures 18" x 24". 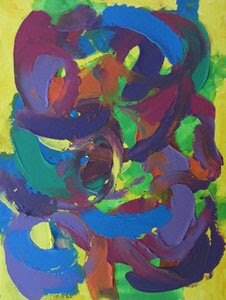 Experimenting with your abstract paintings? There are many things you can try like varying your brush movements across the canvas to get interesting shapes, also experiment with the pressure you apply to show the intensity or peacefulness of the moment. 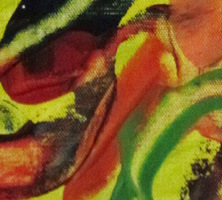 An abstract artist constantly needs to experiment with new painting techniques and styles to grow. What about different brush widths for either bold, or delicate abstract interpretations. 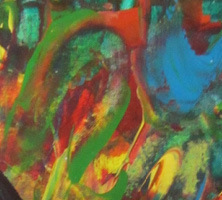 Then try bold colors with contrasting light colors to add even more depth and emotional value to your abstract art. 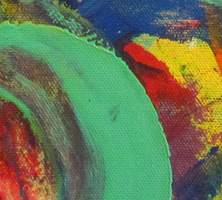 For my abstract paintings I sometimes use everyday items as tools to paint on canvas with. Buy items from the dollar store like combs with varying prong widths, a squishy dog toy with a textured surface you can roll on your painting and try saran wrap, the dollar store has rolls and rolls of it. The great thing about the dollar store expedition is if you don’t like what you tried, you didn’t spend much money on it. I bought a skipping rope to make random curve and circle patterns, spray bottles to splatter paint across the canvas where needed, long fibers to drag through random sections, fake flowers to leave flower impressions and I’ve also stuck buttons on my original abstracts. 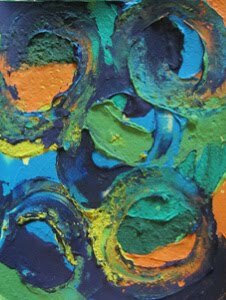 The abstract painting Heavy Rain shown above is a textured acrylic with green, blue, dark stormy blue with flashes of yellow and pink. A downpour of rain has people running for cover, as others watch the storm from inside their homes and decide to stay in. This original wall hanging measures 18" x 24". 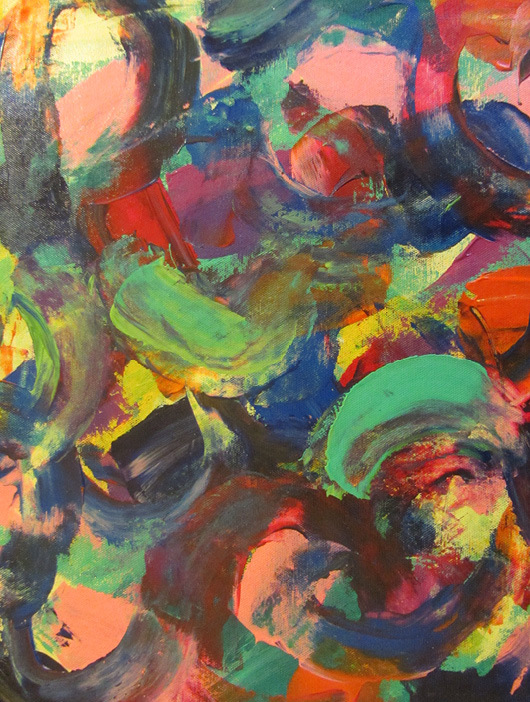 I love colorful abstract art. Fun original paintings with bold colors and textures show your home in the best light and make you smile. Below are a some reasons for you to love colorful contemporary paintings too. You can spend all day looking at an abstract painting hanging in your home. With interesting shapes and textures you just can’t stop admiring it. Friends and family compliment you on how good your home looks with your new abstract painting. It feels warm and welcoming. You feel happier when your wake up looking at inspiring one-of-a-kind art hanging on your bedroom wall. It adds to your well-being, so you know you can get through anything today. Your original art doesn’t have to be expensive to look expensive and it’s easy to find something unique online. 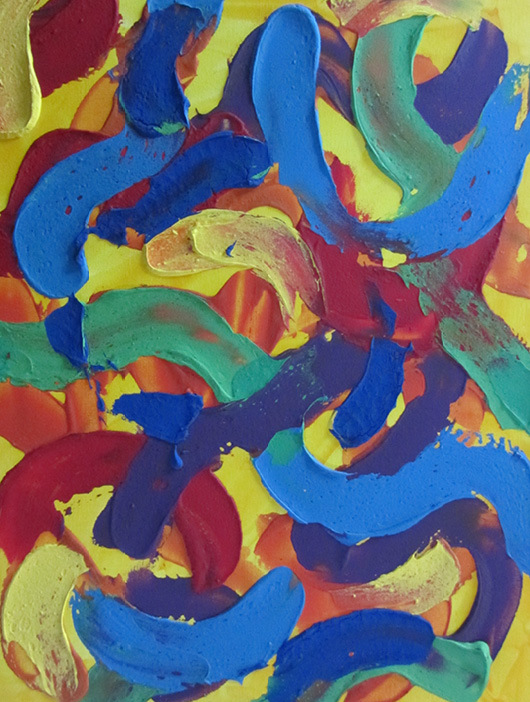 It’s great fun to make your own abstract paintings too. Showcase your creative side by painting something uniquely you. 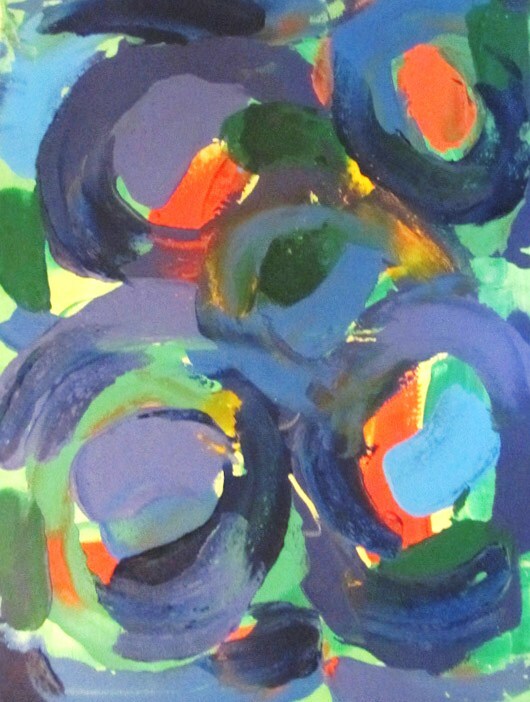 Your bold abstract will highlight who you are; fun, sophisticated and original. Hanging a colorful modern abstract can make old furniture in your living room seem like new again and creates a great focal point to bring everything in the space together. An abstract painting is a great gift for friends. It’s bold, bright and your friends are happy to receive it. 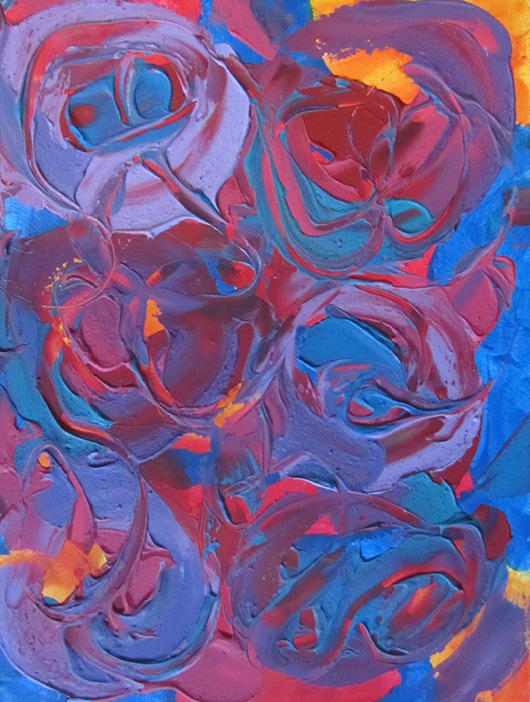 The abstract painting Bluebirds shown above is a textured acrylic with blue, red, pink and orange. A bluebird sings in the early morning from it’s perch in the trees. More bluebirds flying close by land in the trees and join in. This original wall hanging measures 18" x 24". When buying original abstract paintings and art, your friends want honest decorating advice. It’s hard to be clearheaded when buying art with so much to look at. So while shopping for abstracts and other home decor items with friends give constructive opinions on their art and design choices. Encourage friends to look at original abstracts and home decor items that will enrich their lives and inspire them. Your friends tastes in abstract paintings, contemporary artwork and home decor may be different than yours. They might not normally choose the bold colors you would to bring a space to life. They may like antique furniture and neutral tones and think that abstract art won’t mix well with what they have, but abstract art goes with everything and hanging modern abstract paintings gives a home layers of depth. If a friend is heading down a path of blandness in home decorating, you won’t hurt their feelings if you give them a few colorful alternative art and design options. Giving well-thought-out advice to a friend who may need a home decorating intervention can be fun and will save your friend from a possible decorating disaster. 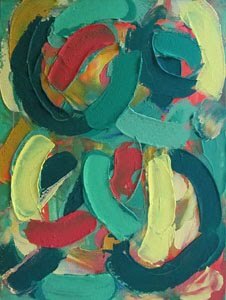 The abstract painting Unmade Bed shown above is a textured acrylic with green, blue, burgundy, pink and yellow blended together. Morning light streams through the windows as the sun rises, waking me from a restful night. Throwing off the blankets and I begin my day. This original wall hanging measures 18" x 24". 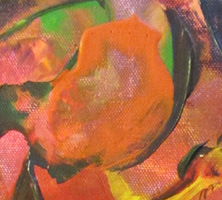 I love bold colorful abstracts with lots of texture and dynamic brush movement across the canvas. 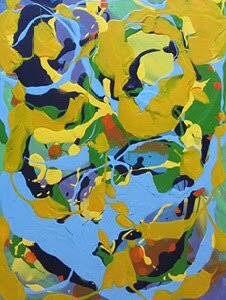 I love abstract paintings that shows a depth of emotion and meaning with an intensity of color, using varying shapes and sizes of brush strokes mingled together. The original abstract art I hang on my walls affects how I feel. So it’s important for me to consider if the abstract painting is inspiring, uplifting, calming or contemplative so I can choose in which room it should hang. 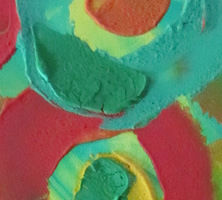 Colorful contemporary art is my antidote against grumpiness and bad weather. When I’m decorating I select original paintings for the walls first, because the art I chose focuses the design for the rest of the room. I always ask myself if the modern abstract wall hanging I chose gives me an inspiring boost, in which case I want it in my living room, kitchen, or any main area of the house. If the composition is more calming then the bedroom will be the right place for a contemplative piece of art, so I can go to sleep calmly and wake up gently. 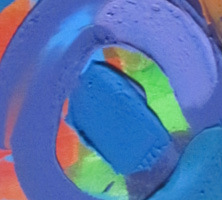 The abstract painting Connected shown above is a textured acrylic with blue, purple, green, red, orange and yellow. 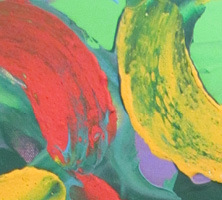 Bold brush strokes connect and overlap with thick textured paint colors expressing the feeling of connection within ourselves and to each other. This original wall hanging measures 18" x 24". I paint colorful abstracts as gifts for friends and family, then I discovered that painting bold modern abstracts gave me a unique opportunity to express myself and I kept painting big experimental canvases all the time. Luckily my family and friends are happy to receive my experiments in original abstract art and incorporated the bold paintings in their own decor. If you want to paint wall art for loved ones, plan to paint several canvases. There is a cost savings to buying stretched canvas and larger paint jugs in bulk. Then there is the fact that modern abstract painting is addictive. Once you’ve made a small collection of colorful textured canvases you just want to make more. 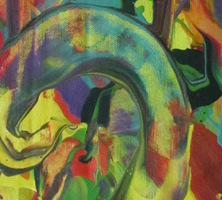 So you can easily use up the excess art materials just by painting more bold abstracts. The creative affliction to constantly want to paint more contemporary abstract art is a good thing, especially when one sister wants the modern abstract painting you just gave to another sister. Now here within your own family you’ve found your first customer and all of a sudden you’re an abstract painter with a small business. 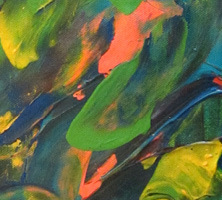 The abstract painting Waterfall Valley shown above is a textured acrylic with red, orange, yellow, green, and blue. Vibrant oranges and reds show the sun setting on a lush green valley between several swirling blue waterfalls. This original wall hanging measures 18" x 24". 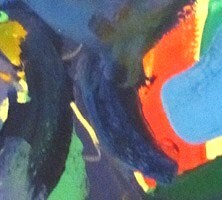 When painting abstracts with my many mixed paint colors and paintbrushes I can’t imagine a world without color. Color is my mood enhancer. To get more bold color in your life, decorate with abstract art! Color used in interior design shows passion, strength, individuality and style. Color attracts attention and many times the intensity of color in an abstract painting just can’t be found in other home decor items. A bright modern abstract can accentuate a room like nothing else can, and that splash of color from your modern wall art is a focal point when paired with otherwise less than inspiring neutral colors. In my studio I have trays and trays of mixed paint. I love all color combinations and use tone on tone, light with dark, or contrasting colors in my painted canvases. 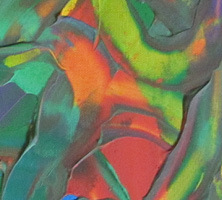 The layering of colors also creates interesting textured effects. 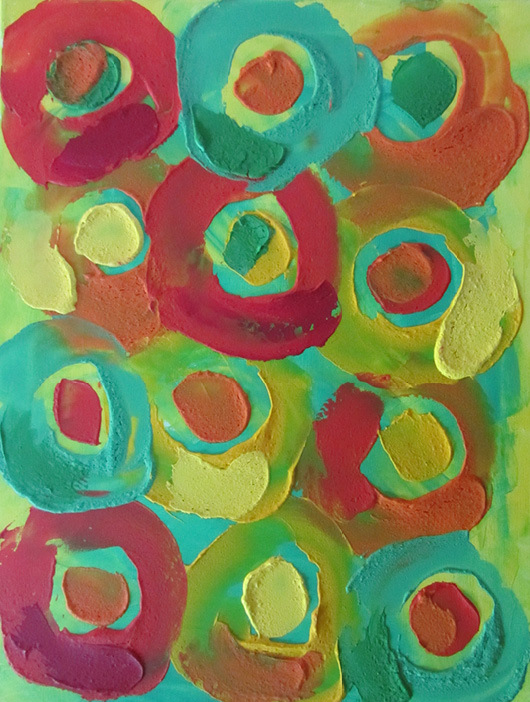 All the choices inspire me to make my contemporary abstracts more vibrant, interesting and even bolder. Is color your mood enhancer too? 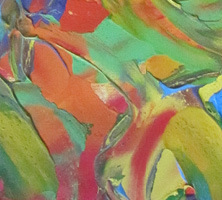 The abstract painting Circus shown above is a textured acrylic with red, blue, orange, green, purple and yellow in a crazy blend of color. The vibrant colored costumes and sets at the circus add to the exhilarating feeling as amazing feats are performed above your head. This original wall hanging measures 18" x 24". Hanging bold colorful abstract paintings is my favorite way to decorate. Vibrant colors and rich textures show up everywhere in my home, it’s a recurring theme for me. Repeating themes with paintings, art and home decor can give cohesion to your decorating style, yet still makes it unique. Start collecting modern abstract paintings, art and home decor in your favorite themes, styles and colors. For instance if you have a favorite color choose a few shades from that color to decorate with... and a contrasting color. Or maybe you have a passion for flowers? There are so many ways to represent flowers from realistic to abstract and everywhere in between, my tip is to chose a variety. So enjoy the hunt for paintings and art created using your favorite themes. People can easily buy gifts for you when they know what you like and what sets you apart from everyone else. My sister loves green and she decorates using green all the time. Of course I made a contemporary abstract painting for her that had lots of green in it and the painting looks fantastic in her home. The trick was to add small sections of contrasting color, it makes her favorite color pop that much more. 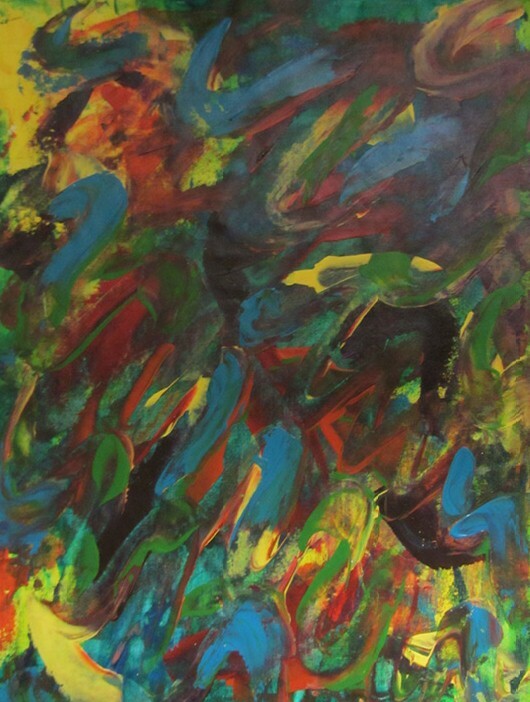 The abstract painting Bird Watching shown above is a textured acrylic with deep purple, blue and green with splashes of red and yellow. The vibrant blue jays, robins and chatty grackles collecting on the trees in the back garden charm me into hours of bird watching. This original wall hanging measures 18" x 24". Hang abstract paintings to make your home more welcoming and vibrant. Be sure to hang as much colorful art as possible. Don’t be sparse with original wall art. Hang at least one painting in each room including hallways, or you won’t get that warm personal feeling you want in your living space. When you’re hanging your colorful contemporary abstracts ask yourself; Does it go with the paintings, art and home decor you already have in that space? If not, place it in another room. Hang your canvases by theme, or by the most prominent colors used in that room. For instance the kitchen can have art and decor with a rustic textured country feel versus a more colorful abstract look in the living room. You always want to be able to see your one-of-a-kind abstracts and other wall hangings, so find which wall is the most prominent and make the painting the focal point of the room. Never stack items up in front of your painting blocking it from view even temporarily, because then the painting’s energy to the rest of the space is cut off and the room loses it’s vibrant personality. Next light your modern abstracts and other colorful paintings properly for maximum effect. Lamps on either side, or above a bold painting will fill in the shadows and make the painting pop with color in the evening when natural light is low. And it doesn’t have to be a strong light to set the perfect atmosphere. 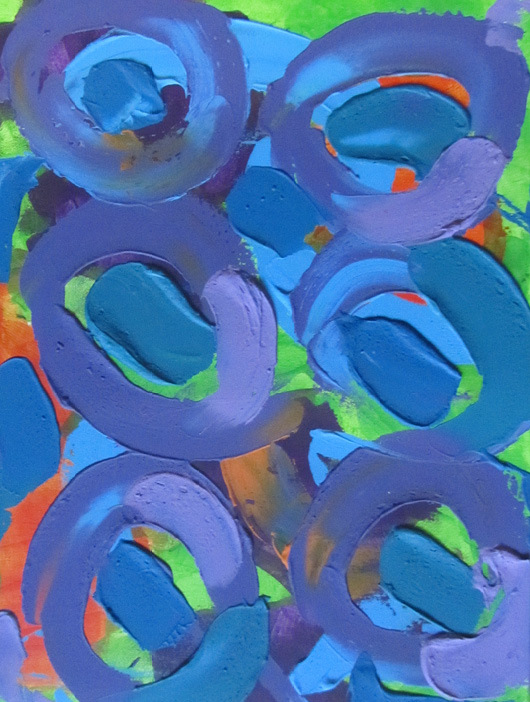 The abstract painting Boating on Gentle Waves shown above is a textured acrylic with waves of soft purple, blue and green water with the sun reflected in orange blended in. The vibrant colors set a rhythm across the canvas like the ebb and flow of gentle waves lapping against the side of a boat at sea. This original wall hanging measures 18" x 24". Using bold abstract art in my home decor is a necessity for me, like breathing. 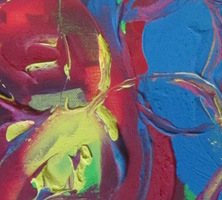 Are you captured by bold colors and the creative spirit in modern abstracts. Maybe you have an appreciation and feeling of contentment when surrounded by beautiful paintings too. I don’t feel right with bare walls staring back at me, I need original abstracts hanging in my home and many of my clients and friends say the same thing. So I’m constantly painting and then also searching out new artists to buy from. You can’t go wrong when you decide to buy art for your home from a new abstract artist. They are eager for business and offer great prices with the hope of getting repeat business. So be an art patron and brighten up your space with colorful contemporary paintings. 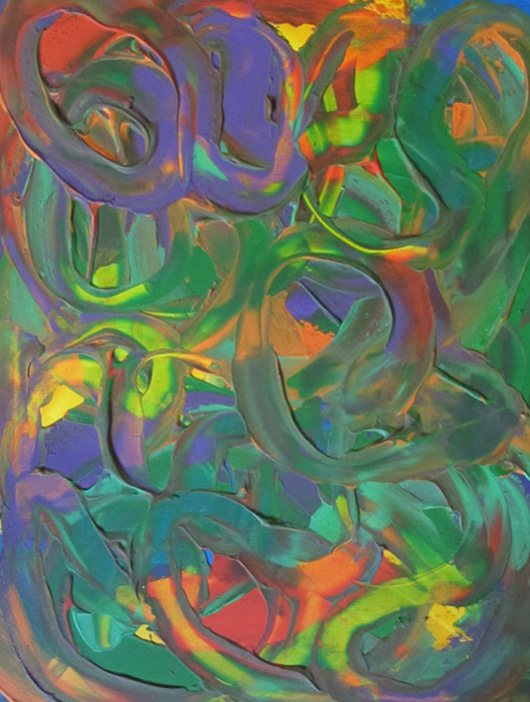 The abstract painting Sweet Dreams shown above is a textured acrylic with swirls of purple, blue, green, red, orange, pink and yellow overlapping and blending together. The vibrant colors fade in and out, like the ebb and flow of gentle dreams passing through your sleeping mind. This original wall hanging measures 18" x 24". Unique abstract art is everywhere in my home. What I look for in art is a bold organic shapes, bright fresh colors and funky cool textures to create a one of a kind living space. How I use original abstract paintings with home furnishings and accent pieces to create my livable home gallery is unique to me. My living space and my art is my painter’s palette of self expression, so my home shows individuality with bold modern art on display for everyone to enjoy. To use wall paintings to maximum effect, shop for abstracts that make a statement on their own with bold colors that pop and textures that add dimension. Beautiful boldly painted canvases should entice you to keep looking. The best original contemporary canvas for you will have that undeniable feeling of bringing everything together in the room and your eyes will always gravitate towards it. 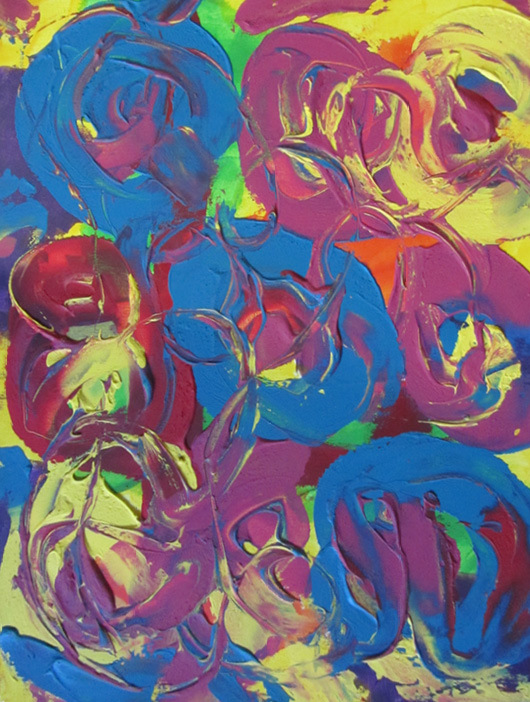 The abstract painting Amusement Park shown above is a textured acrylic with bold swirls of purple, blue, green, red, orange and yellow overlapping and blending together. The vibrant color movement on canvas represents fun rides and roller coasters where kids young and old scream and laugh in joy. This original wall hanging measures 18" x 24". Can your home decor stand to be more adventurous? Colorful paintings, art and accent pieces are an important part of any room makeover. 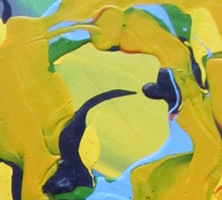 It doesn’t take much to make a positive change, and that’s where bold original abstracts comes in. You can’t go wrong with abstract art. Being casual and comfortable doesn’t mean your home can’t look super fantastic too. Choosing modern contemporary canvases you really love will give you the confidence to shine with friends and family. Show your individuality and creativity by spicing up your home decor with one of a kind wall hangings and bring your social life to life. First decorate with bold colorful abstract paintings on the walls to create focal points in several rooms, then have charming accent pieces placed throughout your home to connect one room to the next. Dramatic layering with color and texture on different spacial planes expands your home making it seem like you have an endless amount of space without creating a cluttered effect. 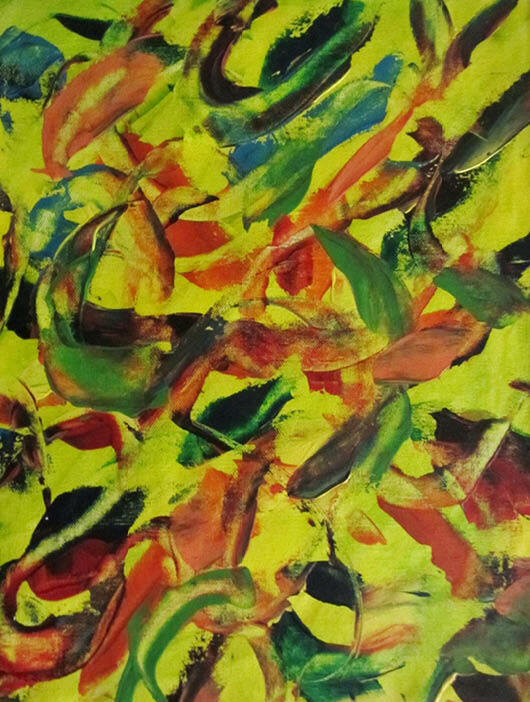 The abstract painting Love Birds shown above is a textured acrylic with strong accents of blue, green, red and orange on yellow. Flowing brush strokes on the canvas show several pairs of vibrant love birds happily sitting close together. This original wall hanging measures 18" x 24". With colorful abstract art your home decorating style can be fun and still be contemporary and modern. If you’ve taken your decorating too seriously in the past and nobody is ever quite at ease in your home try fun bold paintings for a change and feel happy in your living space. People communicate many things without words, use fun abstract wall hangings to make your home more visually welcoming and memorable. 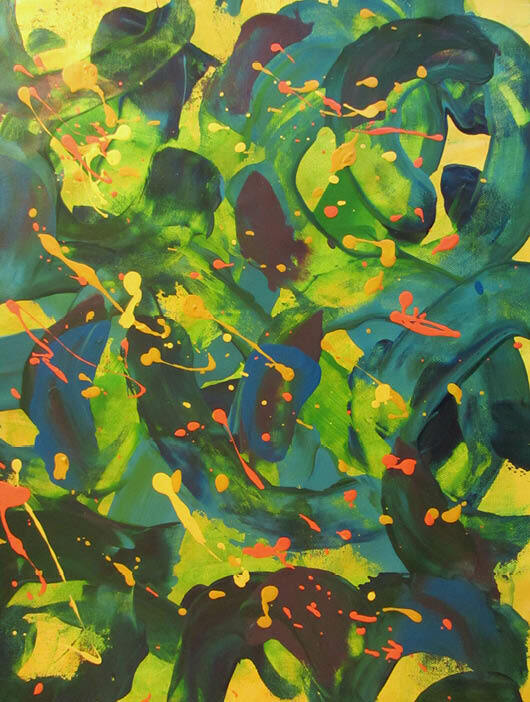 Experiment in your living area with boldly colored abstracts that have thick textures and quirky themes. For instance purchase abstracts that seem to tell an interesting story when you spend some time viewing them, these are the paintings that will give you and everyone around you a cheerful lift. 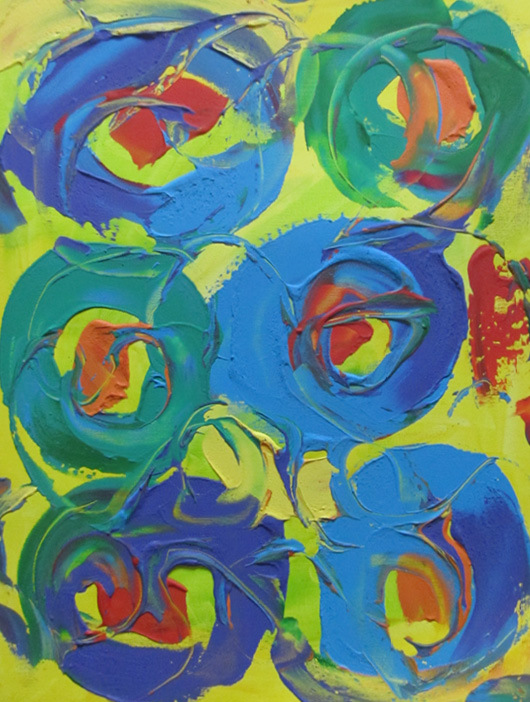 When I visit friends and see original abstract paintings with bold bright colors, thick textures and vibrant brush movement across the canvas hanging on their walls I feel instantly happy. Now when your guests walk into a room your fun abstract wall hangings will set the tone for them to be happy and at ease in your home and with you. 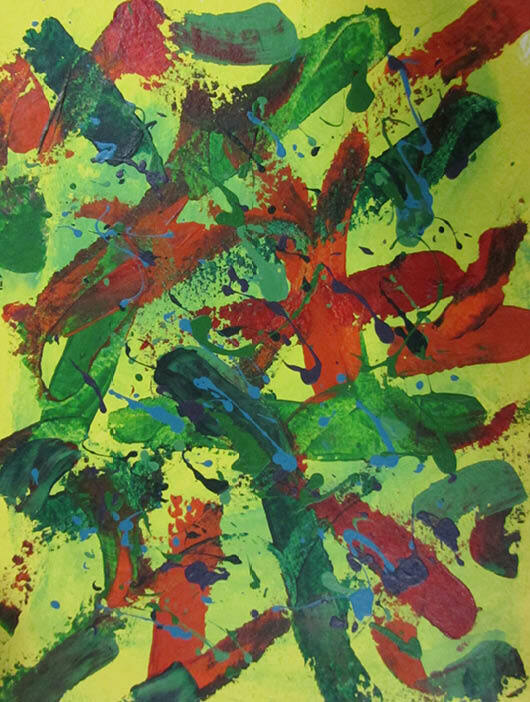 The abstract painting Crazy Dance shown above is a textured acrylic with strong accents of red, yellow and orange mixed with blue and green. 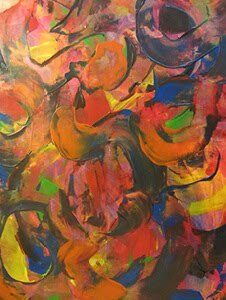 The organic frenetic brush strokes intertwined on the canvas show a vibrant happy woman in a colorful outfit, dancing in her own special way. This original wall hanging measures 18" x 24". Leaving abstract paintings unfinished for days doesn’t annoy me anymore, it’s a creative tool I use. Taking a break from painting my bold contemporary abstracts lets my unconscious mind take over the creative process. When I get back to my painted contemporary art in progress I’m ready with new ideas like adding more color and bold texture where needed. So if I can’t finish one of my modern abstract canvases in a day even after taking a short break I leave it be. Then next time I’m painting in the studio I will finish the abstracts from earlier painting sessions that needed more thought. I never approached painting abstracts this way before, but it feels great not to force the creative process. I get some of my best paintings this way. In the past I would never leave a piece of abstract art half finished, but my approach was not conducive to creating great contemporary works of art that showed my true ability. Now I’m constantly in the process of starting new paintings while finishing other colorful paintings. 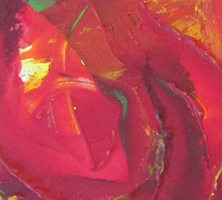 The abstract painting Love shown above is a textured acrylic in striking red, yellow and orange with blue undertones. 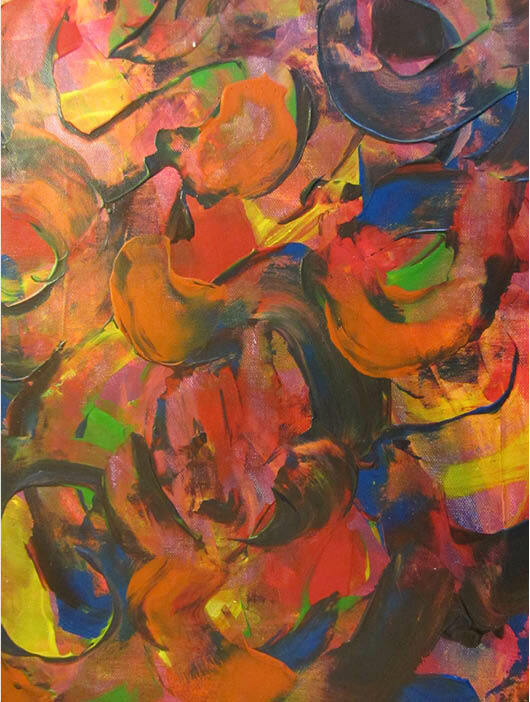 The organic shapes intertwined on the canvas and the bright hot reds and oranges heat up the canvas and surrounding area. This original wall hanging measures 18" x 24". 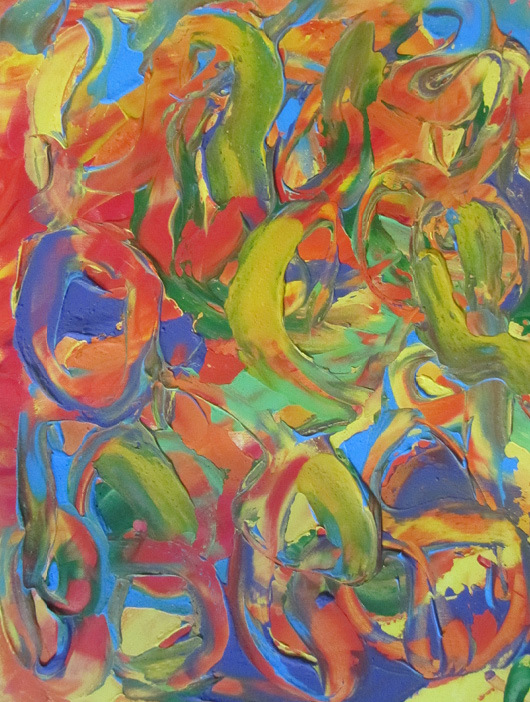 Original innovative abstract paintings happen for me when I’m happy and open to the creative process. Recently I painted a contemporary art piece that just wasn’t going the way I planned, but after a short break, my colorful abstract painting style came together better than I expected. I see now that it’s important to take creative breaks to get a fresh perspective on my original modern wall hangings. So when I create new works of art I take small breaks for lunch, or run errands. 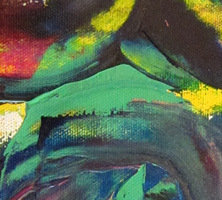 For instance I allow myself to stop painting if I can’t decide if I should add more contrasting colors to a bold new painting, change brushes for a wider brush stroke, build more texture on texture, or if I should just leave the canvas alone. It hardly seems like a real dilemma, but many artists suffer from insecurities and are too critical at vulnerable points in the creative process. I feel painters and other artists move too quickly to judge their work when they could be steps away from creating something really beautiful, because when I come back to my abstract art projects with a clear mind I feel inspired and can see clearly what to do next. 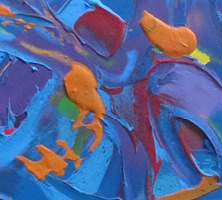 The abstract painting Butterfly Wings shown above is a textured acrylic with paint in striking blue, green, red, purple and yellow, with orange and yellow undertones. 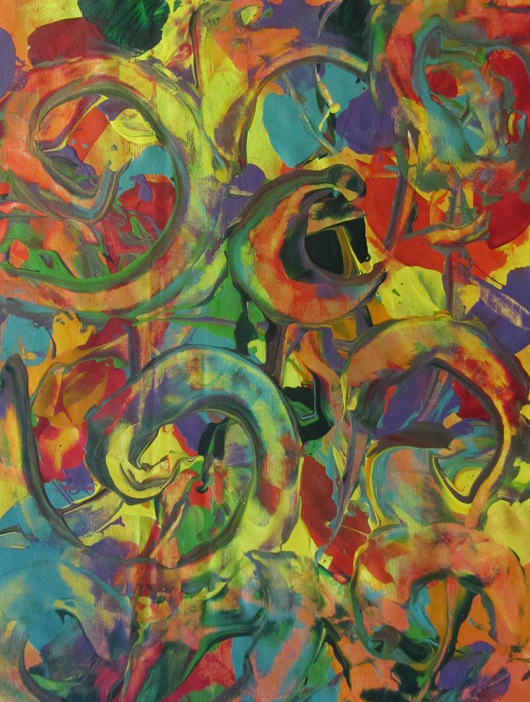 The organic shapes on the canvas and the bright colors represent butterflies in flight in the garden. This original wall hanging measures 18" x 24". 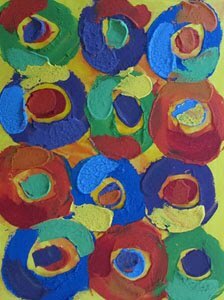 Hang abstract paintings to bring color and happiness into your life. Original modern wall hangings add texture, color and a unique style to home design when otherwise your style might be lacking. Is your living space bright and fun, or somber and dark? You can tell how someone is doing by how they decorate their home. Design your home interior to include colorful abstracts and change how you feel. If you surround yourself with beautiful inspired contemporary paintings and artwork and start to feel beautiful and inspired opportunities will come your way. After your design makeover don’t forget to take time to enjoy your fun bold abstracts and home decor items anytime you need a boost. There’s a benefit to keeping yourself and others around you rejuvenated with paintings and art. If you’re happy you stay healthy. 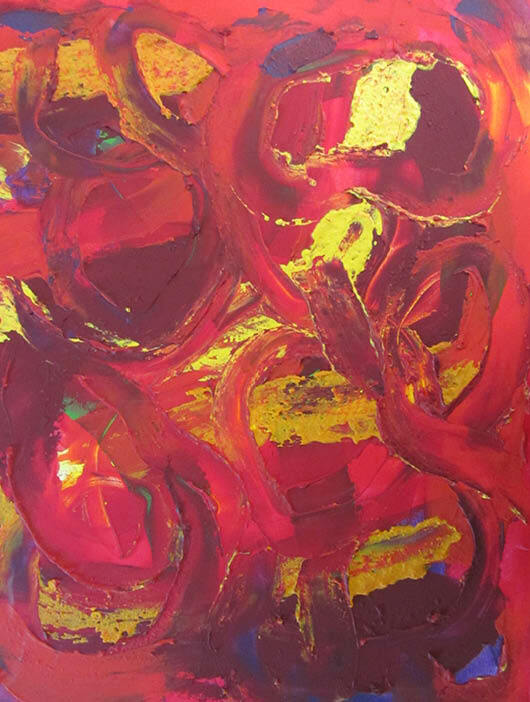 The abstract painting Fire shown above is a textured acrylic in striking red, orange and yellow with green and blue highlights. The movement of the brush across the canvas and the bright colors represent the internal fire burning inside oneself to always push forward and strive for more. This original wall hanging measures 18" x 24". My abstract painting style is based on my own unique tastes and preferences in art and decor. I paint using vibrant colors, thick textures and bold brush strokes that show organic movement across the canvas to get the striking paintings I imagine in my mind. 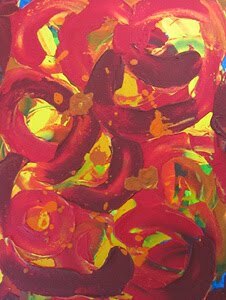 When making my own paintings I love the energy that happens when combining color and texture, like using thick bright colors layered over dark bold shades and tones. 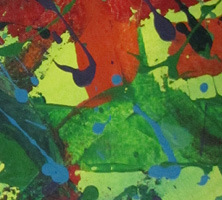 So I freely use striking red, vibrant purple, lush green, bright blue, sunshine yellow and bold orange together in one painting. I also try new brush and spatula styles and splatter techniques to create interesting shapes and add depth. I mix all these elements together for a contemporary wall hanging that is bold, bright and full of life. It’s no surprise that I start with vibrant modern abstracts in any home decor makeover. Fun bold abstract paintings make me smile and then I react more positively to what’s going on around me, even if it’s raining. It’s not magic, just positive reinforcement through art. 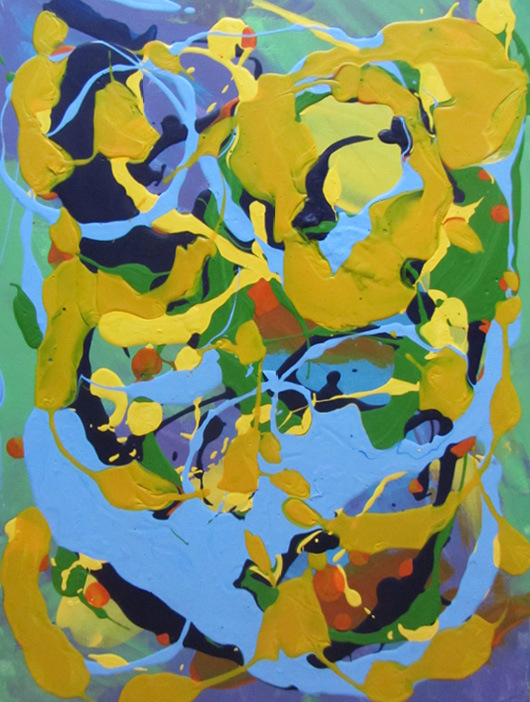 The abstract painting Fireflies shown above is a textured acrylic with broad strokes of paint in striking green and blue on a yellow background with splashes of striking orange and yellow. Fireflies in the back garden are dancing in the evening summer breeze. This original wall hanging measures 18" x 24". 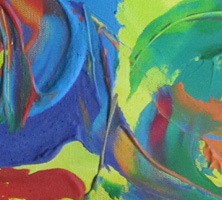 When painting abstracts in my art studio I mix many beautiful bold colors that I thicken with flour. 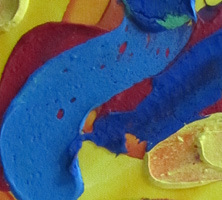 Mixing colors for my modern abstract paintings takes time, but I love it. Each time I paint I mix over twenty colors for my contemporary wall hangings and I use all the paints up within a few days. Part of the enjoyment of creating abstract art is the textures and variations in color I get from blending my paints on stretched canvases with a spatula. So I mix all the new colors in containers that my big baking spatulas can fit in to. I organize all my fun spatulas for abstract painting next to my paints and all my prepared ready to paint canvases are nearby. Being organized doesn’t hold me back, because great things happen when I know where all my painting supplies are and can find them at a moments notice without breaking my creative momentum. It’s also good to be organized in my painting studio so I can put all my supplies away fast and start fresh the next time I paint. 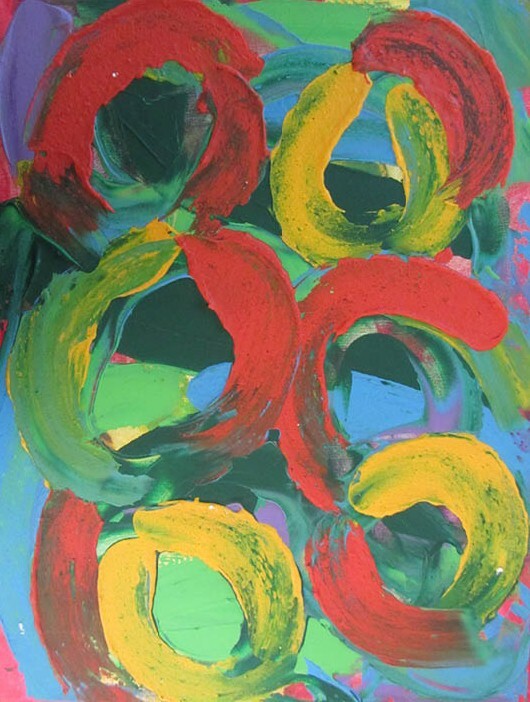 The abstract painting A Funny Story shown above is a textured acrylic with swirls and strokes of paint in striking red, yellow and green on a blue background. Bright colors capture the feel of laughter when old friends get together and retell stories from summers past. This original wall hanging measures 18" x 24". Original abstract paintings keep the focus where it’s needed in your living space. Use abstracts as a starting point and add interesting furniture pieces and decor accents to complete the look. Big abstract art canvases can draw attention to your high ceilings, or focus attention on one main area in a bigger open concept living space. So use a modern abstract painting as focal point to keep the attention on your home’s best features, like a beautiful exposed brick wall or to show how natural light fulls the room by intensifying the colors in your painting and decor accents. You need a design focal point so the viewer has something to center on. Instead of feeling unfocused and uneasy, it’s interesting yet comfortable for the viewer to know where to look. People will be transfixed and at ease when your home looks complete with the right art pieces. When buying an original abstract painting, shop for a canvas that shows your individual style and highlight your home’s features in a colorful unique way. When bold colors, textures and big bold brush strokes stand out in a striking way, they create lingering interest. 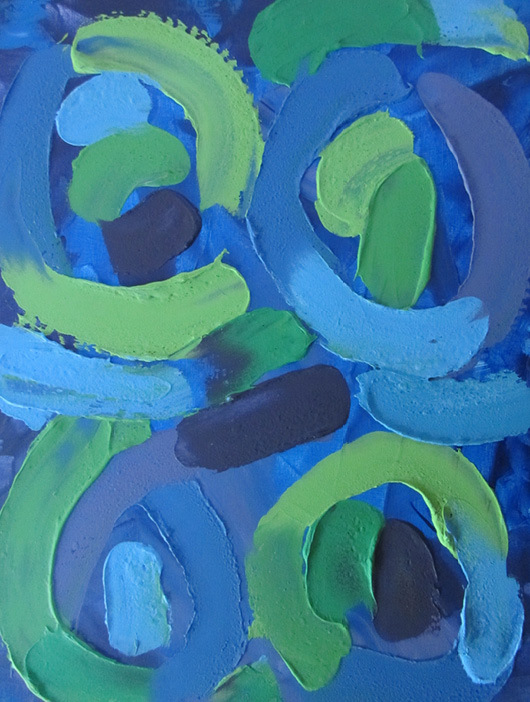 The abstract painting Green Eyed Girls in Blue shown above is a textured acrylic with swirls and broad strokes of paint in striking blue and green with bits of purple peaking through. Bright colors capture two young sister at play outside, skipping and twirling arm in arm, then finally stumbling in fits of giggles. This original wall hanging measures 18" x 24".